MANILA, Philippines - Results are out! 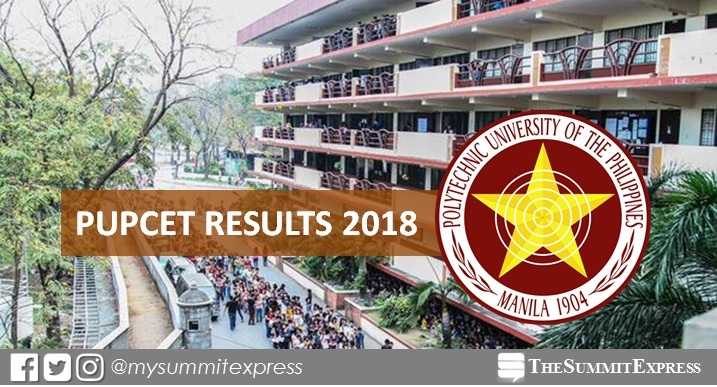 The Polytechnic University of the Philippines (PUP) College Entrance Test (PUPCET) results for AY 2018-2019 are officially released early Friday, March 16, 2018. The complete list of passers and waitlisters are available on this page as announced online. PUP named those who have hurdled the Batch 1, 2 and 3 entrance examinations and hopefuls on the waiting list at PUP Main Sta. Mesa, Manila. A total of 12,162 passed the entrance examination while 1,533 fall on the waiting list. PUPCET was administered on October 14, 2017 (Saturday), December 9, 2017 (Saturday) and February 24, 2018 (Saturday). Aside from Sta. Mesa, PUPCET is also set in all campuses nationwide. On March 1, PUP announced the partial results, list of PUPCET passers qualified for admission in Sto. Tomas, Batangas and PUP Lopez, Quezon campuses for the First Semester, Academic Year 2018-2019. Grade 12 students expected to graduate at the end of AY 2017-2018, and those who graduated from K-12 pilot schools who have not enrolled in any technical / diploma / degree program immediately after graduation with GWA of 82% or higher. The Polytechnic University of the Philippines (PUP) is a government educational institution governed by Republic Act Number 8292 known as the Higher Education Modernization Act of 1997, and its Implementing Rules and Regulations contained in the Commission on Higher Education Memorandum Circular No. 4, series 1997. PUP is one of the country's highly competent educational institution. Monitor this page more often to check relevant updates on PUPCET 2018 results. You may also visit the official website of PUP for other information.